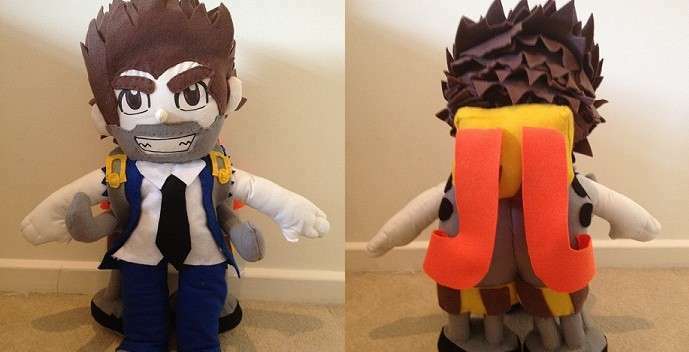 Daisy Parker is a super talented artist and the creator of this wonderful Barry Steakfries plush toy! Her creation was a huge hit at Halfbrick so we reached out to learn more about Daisy’s work and what inspired her to bring Barry Steakfries to life. Check it out! Hi Daisy! Tell us, what inspired you to make a Barry Steakfries plush toy? I chose to make a Barry Steakfries plush toy because I took a liking to the character when I first got Jetpack Joyride. I thought he had a great character design and I wanted to see if I could make him as a plush doll. Where did you learn to make plush dolls? I first started making plush dolls in Summer, 2011. Being a DeviantART member made me want to make them because seeing other plush dolls really inspired me. Mine weren’t very good at first because I didn’t have a sewing machine and could only do them by hand. I also didn’t understand the basics of doll patterns, so the first few dolls came out a little strange-looking. I learned by reading tutorials on DeviantART and a teacher at school also offered to show me the basics of how to sew with a machine. I got a sewing machine for my birthday last year and the plushies came out much better than they did before. I used different coloured felt for the hair, clothes and jetpack. I used freshly bought bed sheet material for the skin and eyes, then ironed them on with t-shirt transfer paper. (Bed sheet material is better to use when ironing on facial features). How long did it take to complete? Can you briefly explain the process? Because I made this in the summer holidays, the doll took me around 3 days. I made patterns of the head, hands, feet and body and I cut out two of each. I then connected these pieces together and stuffed them, forming the basic shape of the plush doll. Next, I added hair and stubble to the doll using patterns I made earlier. I made trousers for the doll using the same body pattern I used for the actual body. I did the same with his shirt and jacket. I then gave him a collar, tie and lastly I made the jetpack. Looking at Jetpack Joyride’s trailer really helped because I could see the jetpack (and Barry) in more detail. I paused it and looked at the shape of the jetpack then started making patterns of what I saw. I then cut out two of each again to make the jetpack 3D, like I did with the body. I then made two straps for the jetpack so it could be removable. Lastly, I printed his eyes and mouth on t-shirt transfer paper and ironed them on. That’s it! My biggest challenge was probably making the jetpack because I’ve never made a jetpack for one of my dolls before. What’s your favourite Barry Steakfries game – Monster Dash, Age of Zombies or Jetpack Joyride? I think it would have to be Jetpack Joyride because I love the gameplay, music and missions you can do. What’s the coolest vehicle in Jetpack Joyride? I think the Profit Bird is my favourite vehicle because I love tapping on the screen to make it fly and I love collecting the coins when the Profit Bird is golden! Are you working on any other creative projects? At the moment I don’t really have any other projects to make because college gets in the way. I’ve just finished a Gorillaz plush doll and I also had to make a Crash Bandicoot hat for one of my units in college. I’ve just finished that as well! My dream job is to be a concept artist in the gaming industry and hopefully one day show my own gaming project which I’ve been working on for a couple of years. I’d love to make that into a proper series! Thank you very much for interviewing me and I will hopefully make some more fan art of Barry Steakfries soon! A huge thanks to Daisy for taking the time to speak with us! We can’t wait to see more of her work and have no doubt she’ll make a great concept artist in the very near future! Thanks for reading everyone and be sure to let us know if you see other awesome projects by the talented members of our community!